In every college dorm room around the US (and likely other countries)....in every household pantry where a child lives....in every supermarket across the land, Momofuku Ando lives on. You may not know him by name, but as soon as I tell you that he's the guy responsible for inventing ramen noodles....and that he died on Friday....you're bound to say "awww." Born in Taiwan in 1910, he died at the age of 96, leaving behind his legacy of the cheapest meal around. In 1948, he founded the precursor to Nissin and in 1958 unveiled Chicken Ramen, the world's first instant noodle product. Ando was inspired to develop the instant noodle after coming upon a long line of people on a cold night shortly after World War II. They were waiting to buy freshly made ramen at a black market food stall. The experience convinced him that "peace will come to the world when the people have enough to eat," according to Nissin. In 1971, Nissin introduced the Cup Noodle featuring instant ramen in a waterproof plastic foam container. Dubbed the "Ramen King," Ando is credited with expanding Nissin into the No. 1 company in the industry and was well-known for his dedication to his work. The news last Friday of the death of the ramen noodle guy surprised those of us who had never suspected that there was such an individual. It was easy to assume that instant noodle soup was a team invention, one of those depersonalized corporate miracles, like the Honda Civic, the Sony Walkman and Hello Kitty, that sprang from that ingenious consumer-product collective known as postwar Japan. But no. 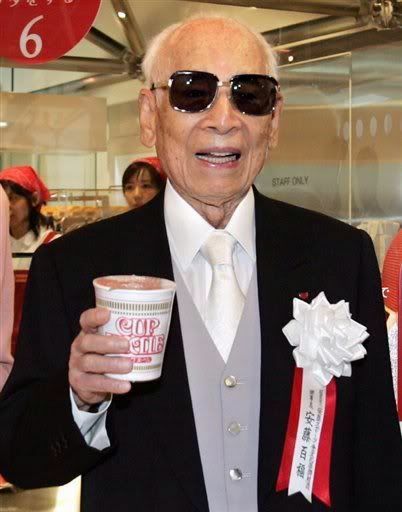 Momofuku Ando, who died in Ikeda, near Osaka, at 96, was looking for cheap, decent food for the working class when he invented ramen noodles all by himself in 1958. His product — fried, dried and sold in little plastic-wrapped bricks or foam cups — turned the company he founded, Nissin Foods, into a global giant. According to the company’s Web site, instant ramen satisfies more than 100 million people a day. Aggregate servings of the company’s signature brand, Cup Noodles, reached 25 billion worldwide in 2006. There are other versions of fast noodles. There is spaghetti in a can. It is sweetish and gloppy and a first cousin of dog food. Macaroni and cheese in a box is a convenience product requiring several inconvenient steps. You have to boil the macaroni, stir it to prevent sticking and determine through some previously obtained expertise when it is “done.” You must separate water from noodles using a specialized tool, a colander, and to complete the dish — such an insult — you have to measure and add the fatty deliciousness yourself, in the form of butter and milk that Kraft assumes you already have on hand. All that effort, plus the cleanup, is hardly worth it. Ramen noodles, by contrast, are a dish of effortless purity. Like the egg, or tea, they attain a state of grace through a marriage with nothing but hot water. After three minutes in a yellow bath, the noodles soften. The pebbly peas and carrot chips turn practically lifelike. A near-weightless assemblage of plastic and foam is transformed into something any college student will recognize as food, for as little as 20 cents a serving. But those are minor quibbles. Ramen noodles have earned Mr. Ando an eternal place in the pantheon of human progress. Teach a man to fish, and you feed him for a lifetime. Give him ramen noodles, and you don’t have to teach him anything. 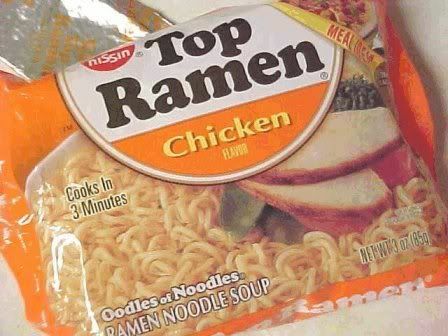 I had a suitemate who was always cooking Top Ramen in a bowl. I don't doubt Ramen will live on for generations. I love those noodles. Interesting info you have here on him.